When it comes to Football, or, for the sake of those in the U.S., Australia, New Zealand and others, Soccer, Electronic Arts’ FIFA series has long since been seen as the authority. Pro Evolution continues to battle away, but when it comes to September-October time of the year, most true footy fans yearn for the latest FIFA. Although we’re just approaching Summer at this point, now’s the time of year when EA usually begins to whet the appetites of soccer fans worldwide, and right on cue, a gameplay trailer has been released of FIFA 14. The main reason FIFA has become the dominant force in the field of soccer simulation is not just because of the cutting edge graphics in emulating players, commentary and stadia, but for the ultra realistic gameplay. Just like the real thing, it’s as much about tactics and off-the ball running and movement as it is the standard of players, and the days of being able to play as the best teams and win every time based on pound-for-pound superiority are long gone. 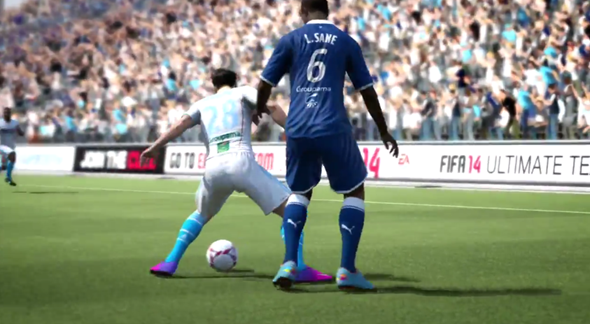 In-keeping with the previous few releases, FIFA 14 once again ups the ante, delivering a plethora of new features in what is easily the most realistic simulator to date, as it was first revealed at the Xbox One reveal event. As you will see in the trailer below, there’s a new Precision Movement implementation which, when combined with the impressive Pure Shot feature, delivers a devastatingly immersing and captivating experience. Right from the initial still preview of the video, before you even get to hit the play button, it’s really striking how true a representation some of the in-game players are, and with special emphasis on some of the unmistakably unique traits of individual stars, FIFA fans are in for a real treat this time around. As well as Precision Movement and Pure Shot, there’s also a nice little Real Ball Physics feature, which makes the ball spin, dip and curve in an ultra realistic fashion. So now when you score that impressive free-kick or bicycle volley, it may actually be worth uploading to YouTube!